Onboarding is more than a one-day orientation. It's a crucial period of time in a new-hire's career that can define the rest of his or her future with the company. One of the most important phases in an employee's tenure is his or her first year with the company. Much of their success will depend on your onboarding practices. 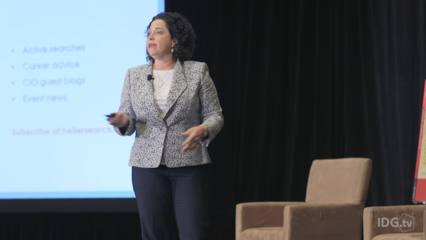 And as everything goes digital, so should your employee onboarding, according to Lisa Sterling, chief people officer and executive vice president at Ceridian, a human capital management technology company. Sterling says businesses should know that employees are going to expect it. Today, so much of what we do has gone digital and if you aren't modernizing the onboarding process, new workers will take note. And having an automated onboarding approach isn't just for employees either, your managers will thank you too. If management can rely on a tried-and-true onboarding process, they can focus on getting the new hire acclimated, rather than wading through paperwork. By bringing technology into onboarding, you eliminate a lot of the grunt work in the process. Introducing technology into onboarding can even be as simple as storing documents digitally in one place so they can be quickly updated and shared across the company. Or you might want to create an employee directory so new employees won't have to worry about forgetting names or titles. It will make the process simpler for everyone involved, whether it's the new hire, manager or even the HR specialist. During their first few months, new employees might feel like they are making their first impression on their employer, but the onboarding stage is also the time when companies make their first impression on employees. And you don't want to leave them dissatisfied. "A disastrous onboarding experience can have financial repercussions and can cost an organization its key talent when their experience is less than stellar. Getting the onboarding experience right can create an immediate connection and sense of loyalty to the organization and can create a sense of engagement and excitement for individuals," says Sterling. She says for companies that can get onboarding right, they not only help foster company culture, they also encourage engagement, emphasize the company brand and increase efficiency and productivity in the workplace. And sometimes the first impression is in the details -- such as, is the new employee's phone set up, is their computer ready and is their desk or cubicle ready for them? Unfortunately, it seems that these considerations are lacking at plenty of companies. A study from Office Team, a Robert Half Company, of 317 workers in the United States found that more than half of workers report having "at least one mishap when starting a new job." Of those surveyed, 33 percent said their technology wasn't properly set up, 22 percent said they didn't have the necessary supplies provide,16 percent said they didn't even receive an overview of the company, 15 percent said they didn't receive introductions to colleagues and 14 percent didn't get offered a tour of the office. Employees are the most engaged in the first six months with a company, and after that it begins to drop. And a recent survey from Gallup found that as much as 70 percent of American workers are disengaged in their jobs. However, companies that can manage to keep their employees engaged were shown to have a "90 percent better growth trend than their competition," and "outperformed their peers by 147 percent in earnings per share," according to Gallup. That means it's important to encourage new-hire engagement levels or you might stand to lose the employee -- thus starting the recruitment, hiring and onboarding process all over again with a new person. "People formulate their opinions about the organization based on how those first few critical moments and experiences are handled," says Sterling. A poor onboarding experience can immediately impact a new employee's perception of the company, decrease their loyalty and even impact their overall future with your company. "Some individuals will go as far as to not return after a disastrous first day, the impacts of this are significant in terms of morale, financial implications and potential damage to the employment brand," says Sterling. Sterling says her business has automated much of the onboarding process to help streamline it across the company. And for Ceridian, the results have been positive. "It has reduced the time it takes to get a person ready for a successful first day as well as reduced the redundancy in managing all the moving parts of the process," she says. Remote workers are just as important as their in-office counterparts. Automating your onboarding process is a great way to ensure that everyone gets the same experience, no matter where they're located. Tricia Sciortino, president of eaHELP, a virtual assistant outsourcing firm, works with a mostly remote team, and has found that there are certain ways to help these non-traditional workers feel a part of the company culture. It might take a bit more effort, since managers can't just swing by a new remote worker's desk, but with technology, it's possible to make it a great experience for everyone. She suggests training on webcam, supplying self-study topics, having procedures and documentation at the ready and even supplying new remote hires with videos of other workers using applicable software and systems. And don't forget to offer them a virtual welcome, setting aside time to get everyone on the team in one room in front of a camera, so they can get to know the people they will be working with. Onboarding should be viewed as a long-term experience for employees -- ideally within their first year of employment. It needs to be more than training or orientation, it's an immersive experience that helps an employee thrive in your business, says Sterling. She goes as far as to say employee onboarding shouldn't just be in the first 12 months of an employee's career, but also when employees transition departments, move into a new role or get promoted. "Some more progressive organizations would say the onboarding experience is never ending. Our philosophy is that creating these experiences only for new hires is simply not enough in today's competitive talent market. We should be equally focused on providing the same level of engagement and support when people move into a new role, are promoted or transition out of the organization," says Sterling.